Analyses of cadmium concentrations in biological material are performed using inductively coupled plasma mass spectrometry (ICP-MS) and atomic absorption spectrometry (AAS), but also electrochemical methods, neutron activation analysis (NAA), and X-ray fluorescence spectrometry (XRF). The predominant sample matrices include blood, plasma, serum, and urine, as well as hair, saliva, and tissue of kidney cortex, lung, and liver. While cadmium in blood reveals rather the recent exposure situation, cadmium in urine reflects the body burden and is an indicator for the cumulative long term exposure. 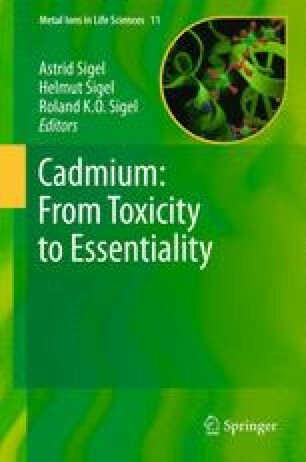 After chronic exposure, cadmium accumulates in the human body and causes kidney diseases, especially lesions of proximal tubular cells. A tubular proteinuria causes an increase in urinary excretion of microproteins. Excretions of retinol binding protein (RBP), β2-microglobulin (β2-M), and α1-microglobulin are validated biomarkers for analyzing cadmium effects. For this purpose, immunological procedures such as ELISA, and radio- and latex-immunoassays are used. However, proteinuria is not specific to cadmium, but can also occur after exposure to other nephrotoxic agents or due to various kidney diseases. In summary, cadmium in urine and blood are the most specific biomarkers of cadmium exposure. A combination of parameters of exposure (cadmium in blood, cadmium in urine) and parameters of effect (e.g., β2-M, RBP) is required to reveal cadmium-induced nephrological effects. We wish to thank Dr. Thomas Göen and Mrs Piia Lämmlein for their support in preparing this manuscript. Cadmium. Determination in Urine (Electrothermal atomic absorption spectrometry). Biomonitoring Methods, Analyses of Hazardous Substances in Biological Materials, Wiley-VCH 1984 (http://onlinelibrary.wiley.com/book/10.1002/3527600418/topics). Antimony, Lead, Cadmium, Platinum, Mercury, Tellurium, Thallium, Bismuth, Tungsten, Tin. Determination in Urine (Inductively coupled plasma quadrupole mass spectrometry). Biomonitoring Methods, Analyses of Hazardous Substances in Biological Materials, Wiley-VCH 1999 (http://onlinelibrary.wiley.com/book/10.1002/3527600418/topics). Immundiagnostik AG, ®2-Mikroglobulin ELISA-Kit zur in vitro Bestimmung des ®2-Mikroglobulin aus Plasma, Serum und Urin (http://www.labodia.com/Kit_Protocols/inserts_immundiagnostik/immuno/b2Microglobulin.pdf; http://www.immundiagnostik.com/home/unternehmen/unternehmen-und-schwerpunkte.html), Bensheim, 2010.